An all-female gang of thieves is preying on married men in the town. Level-dependent amount of gold, Witsplinter. Learn from Anvil residents about gang problems. Speak to Maelona and Gogan. Head to The Flowing Bowl and wait for a woman to approach with a tempting offer. Go to Gweden Farm at the pre-arranged time. Confront the gang about their activities, and kill them all. Receive your reward from either Maelona or Gogan. You may hear from some residents in Anvil about an all-female gang of thieves who pick only on married men. They lure them in with their charms and then rob them. You will be pointed in the direction of Gogan, who lives in Gogan's House at the west end of Anvil. At his house, you will find both Gogan and his wife, Maelona, who tell you that Gogan was tricked by the thieves and that they stole his wife's ring, which was a family heirloom. They will both ask you to help them, and suggest that you start at The Flowing Bowl, which is where Gogan was approached. Head off to The Flowing Bowl down by the docks and wait. Two women (Signy Home-Wrecker and Faustina Cartia) enter The Flowing Bowl and approach you. If you are male, they seductively invite you to have a "night of fun" at their farmhouse just outside of town; if you are female, they invite you to join their gang. You are told to meet them after 11pm at Gweden Farm, which is now marked on your map. Note: due to a bug, the player may become locked in the farmhouse with no means of escaping. Thus it is advisable to save before entering the farmhouse if playing on a console. When you arrive at the farm Faustina will be inside. Do not immediately attack her; you must first talk to her. She asks you either to take off all your clothes and weapons if you're male or, if you're female, to confirm that you want to join their gang. Refuse to do so and tell her that you know what she's up to. After you say this, Signy and Tsarrina appear. Normally all three attack you, and force you to kill them. If you have previously increased Signy's or Faustina's Disposition toward you, however, they may not attack. In this case, you still need to kill them to complete the quest, but initiating combat will cause their deaths to be counted as murder. To avoid this, simply talk to them, which should lower their disposition toward you. After you kill your attackers, Gogan and Maelona come in through the door, dressed in City Watch armor. They explain to you that they work for the City Watch and that they needed a stranger like you to help foil the thieves. They thank you and reward you with a level-dependent amount of gold (see chart below). Before leaving the farmhouse, be sure to search and loot the sirens' corpses (after you leave the main room of the farmhouse, their corpses will all disappear). On Faustina's corpse you will find the Witsplinter, a leveled enchanted dagger, and the Gweden Basement Key. The key provides access to the basement, where you will find a stash of all the things they stole from the married men in town. It is not possible to return these items to their original owners, as there are no additional related dialogue options, so you are free to keep the items for your own use. After Gogan and Maelona have left the farmhouse the front door is permanently locked, so be sure to take everything you want with you before leaving. After you complete this quest, a special edition of the Black Horse Courier is published: "Anvil Tarts Thwarted!". If the Mythic Dawn Sleeper Agent Isolde attacks you in The Flowing Bowl after the completion of the Dagon Shrine quest, the resulting fight may kill one of the sirens, rending this quest uncompletable. Several of the items found in the Gweden Farm basement are rare zero-weight items: Ernest's Fancy Pants, Ernest's Best Shirt, and Heinrich's Shirt. This quest is one of the few occasions in the game in which your gender influences events. When offering you the task, Maelona promises that "I'm willing to give you all the money I have to get it back. 100 gold. ", but in fact the reward is leveled. The house is also inaccessible after it is left, so it is recommended that you take all desired loot before leaving (especially the unique zero-weight items, which are very useful for enchanting). Signy Home-Wrecker has a very high aggression, so drawing a weapon or having high infamy may result in her immediately attacking you. She may also become hostile with a low disposition. On the Game of the Year edition for the Playstation 3, the Sirens may never leave The Flowing Bowl after the initial encounter. If you then enter the farmhouse, you will be trapped inside. Thus it is advisable to save before entering the farmhouse. However, it is still possible to finish the quest. See the talk page for more information. The Sirens (after meeting them again in the farmhouse), may become hostile immediately and attack. This causes you to fail the quest due to the skipped 'talking' quest stage. ? This can be fixed by using the console command stopcombat, or by increasing disposition beforehand (through use of fortify personality or speechcraft). They should then initiate conversation normally and allow the quest to continue. Going to jail during the quest will usually make Signy reappear outside the jail when you are released. It is therefore recommended that you do not get arrested after the Flowing Bowl meeting, although it is possible to continue the quest by traveling to the farmhouse, where Signy may follow you. ? On talking to Faustina, she has no dialogue options. Loading a previous save is the simplest known fix for this. Use the console command setstage MS04 55, which will advance the quest, and then turn the women hostile using either console commands or attacking. If you kill Gogan and/or Maelona after completing the quest (while they are still in the farm house) then you will not get a bounty, as these are treated as different NPCs and they will still be alive in Anvil (assuming you did not kill those versions). If you arrive outside the farmhouse between 11pm and 12am, you will receive both journal entries for stage 50 since the condition for the "... I'll need to wait..." entry uses the or operator rather than AND, thereby failing to correctly enclose the intended time range. After completing the quest, exploration of basement may result in the front door of the farmhouse being locked, and you being trapped inside. Faustina and Signy may get stuck in The Flowing Bowl and never leave for the 11pm rendezvous at the farm. ? Move them to your location via player.placeatme <id> (3aa85 for Signy, and 3aa89 for Faustina). You will also have to advance the quest after they are dead (using setstage MS04 60). 5 I've heard an all female gang of thieves is preying on the men folk of Anvil. While I didn't get all the details, I was pointed in the direction of Gogan and Maelona, two local Anvil residents. Somehow, Gogan is "intimately" involved whatever that means. 10 I've spoken to Maelona, a Reguard [sic] commoner who lives in Anvil. It seems that a gang of female thieves has taken up residence somewhere nearby. They're luring men out to their farmhouse by seducing them, and then in actuality, robbing them of all their goods when they arrive. The men are so embarrassed about this that they won't report it to the authorities. Maelona's husband is one of the "victims". 20 Upon further questioning, I've discovered that Maelona's husband, Gogan, was carrying a family heirloom when the all-female gang robbed him. She's desperate to get the ring back, and is offering 100 gold for its return. 30 Maelona told me that the men are usually approached at the local watering hole, The Flowing Bowl. That's where I should make contact with the gang. I should speak to Gogan, as he may be able to add some more useful information. 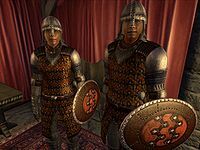 35 After speaking to Gogan, I've learned that there are at least two gang members, an Imperial and a Nord. They lure men to a remote location, trick them into removing their clothes and equipment, and then ambush them while they are defenseless. I think at this point I have enough information to pay a visit to The Flowing Bowl. 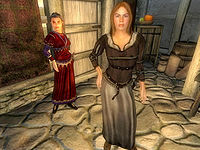 100 1Yes Maelona and Gogan entered the farmhouse in Anvil City Guard armor. It turns out that they have been undercover as a married couple for some time trying to put a stop to the gang. She says I was spotted heading to Gweden so she went back for reinforcements and headed here. She said she would take care of the bodies, and paid me my gold as promised. 110 1Yes Maelona and Gogan entered the farmhouse in Anvil City Guard armor. It turns out that they have been undercover as a married couple for some time trying to put a stop to the gang. She says I was spotted heading to Gweden so she went back for reinforcements and headed here. She has taken Faustina into custody and paid me the gold she promised. 150 1Yes I fear I've slain one of the gang members prematurely. Although this puts a stop to the crimes, a better way may have been available had I followed through with the undercover operation. It is possible to use the console to advance through the quest by entering setstage MS04 stage, where stage is the number of the stage you wish to complete. It is not possible to un-complete (i.e. go back) quest stages. See SetStage for more information. Esta página foi modificada pela última vez à(s) 14h46min de 11 de maio de 2015.